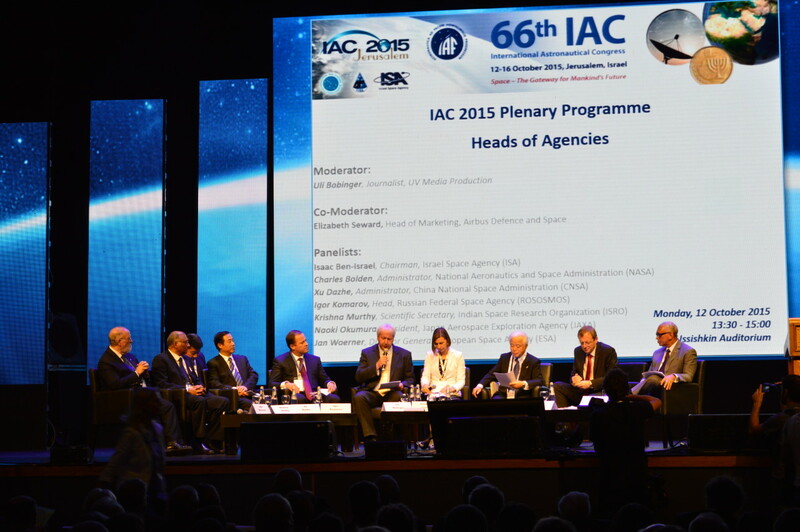 Despite heightened security tensions in Jerusalem, a crowd of over 2,000 people from 58 nations gathered for the 66th Annual International Astronautical Congress (IAC), the largest annual event designed for the study and development of the space industry. The event is being hosted by the Israel Space Agency and the choice of Jerusalem is generally regarded as a testament to the growing role that Israel has come to play in space initiatives. The IAC will feature a five-day program with some 2,600 academic papers presented. Among the attendees are the heads of all the major space agencies including NASA Administrator Charles Bolden who will announce a new working agreement with the Israel Space Agency. Speaking with reporters, Bolden focused on the recent New Horizons mission which reached Pluto in recent months and returned remarkable images which grabbed the attention of the world. Aldrin remains very active in promoting initiatives in the area of space discovery and travel and opened his remarks by saying, “I feel very fortunate to come along at this time in human history.” While in Jerusalem, Aldrin also helped launch a new initiative together with the Israel Space Agency and the Israeli Ministry of Science and the Heinlein Foundation which would promote interest in space education amongst Israeli youth. The Foundation presented three original space suits which will travel among Israeli schools.